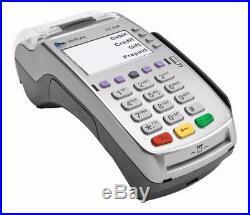 This Listing comes with - Brand New Verifone terminal in original Box, Ethernet Cable and Power Supply. The dual-communication Verifone® VX 520 includes everything you need in a stand-alone countertop device speedy processing, expansive memory and flexible acceptance hardware. The advanced VX Evolution software platform relies on the familiar Verix operating system, eliminating retraining for staff. An integrated contactless reader allows your customers to tap and go, the chip card reader will process EMV credit and debit cards too. Memory : 160 MB (128 MB of Flash, 32 MB of SDRAM). Physical : 203mm L x 78mm W x 87mm H; 500g weight. The item "Brand New VeriFone Vx520 EMV Credit Card Machine #M252-753-03-NAA-3" is in sale since Sunday, November 5, 2017. This item is in the category "Business & Industrial\Retail & Services\Point of Sale & Money Handling\Credit Card Terminals, Readers". The seller is "possiblepos" and is located in Stafford, Texas. This item can be shipped to United States.